A thin layer of sweat sheathed my skin, keeping my body perpetually moist. It wasn’t sunny under the thick canopy of creeping vines and jungle trees, but the air was hot and thick, constipated with the monsoon rains that still haven’t come. Much of the forest floor was patched with black spots where guides had set fires so that the crumpling underbrush would burn in small controlled flames instead of one raging wildfire. Ash and spider webs clung to my arm hairs. But despite the smell of burning grass that hung on the air, much of the jungle was still green and thriving. And so were its creatures. It was just a jungle walk- one of those ‘maybe you’ll see animals, maybe you won’t’ type of things. I was walking casually down a soft sanded Jeep path when my guide made a noise to get our attention. I turned to see him crouched down on his haunches, leaning on his walking stick, and staring between the tree trunks off of the left side of the path. He looked up at us and whispered, “Rhino.” Then he waved for us to walk backwards quietly and peer through the trees. Tension pulled tightly on the heavy air. Sunscreened hands gripped their SLR cameras, but no one dared to take a picture. At the beginning of the walk, the guide had told us what to do just in case we encountered any aggressive wild creatures. The trick for rhinos is to climb up a tree. They can’t see up. I couldn’t see anything at first. The rhinoceros’s grey hide blended in with the brown trunks and underbrush. As soon as it moved though, it was unmistakable. It walked a few steps backward and then turned toward us. For a heartbeat I stared at the two black eyes and small horned head that crowned the Hummer-sized beast. It took a step toward us, and the guide turned, his index finger to his lips, and motioned for us to go back. The French tourists in our group ran back the way we’d come. I looked around to check the climability of the nearest trees while slowly stepping backward. I can’t describe what it was like to see such a huge beast in its native habitat. It’s the type of thing that needs to be felt in order to be understood. During an elephant ride later that day, I saw five more rhinos and spotted deer and non-spotted deer and wild boar. Even though I grew up near the woods in Pennsylvania, I’ve never seen so much wildlife in one place before. 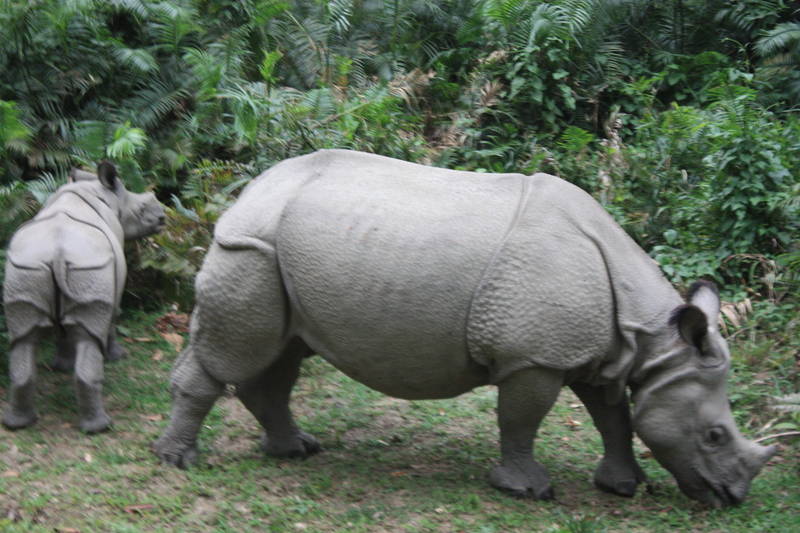 The rhinos here were nearly hunted to extinction, but the Nepali government stepped in and created strict rules and strong fines that now protect all of Chitwan’s wildlife. The park is pristine, especially in comparison to the Keralan backwaters- another biological treasure, but one that isn’t protected by government regulation. It would be naïve of me to say that we need to be eternally conscious of the wellbeing of wild animals and precious natural places so that people can always have the chance to enjoy them. Maybe this is a reason for preservation of our natural resources, but so often the argument gets left at that. Even people who will never trek in a jungle are connected to that jungle’s resources. We can’t even begin to imagine the vast interconnectedness of all living things (although science can certainly begin to sketch a vague picture). A single blog post can hardly serve a reasonable explanation. Appreciation of living things and wild animals is a reason to demand their protection, but don’t stop at that- keep thinking about it. Although it must have been hard to capture your full experience in words, I felt as though I was with you right there and then! I can’t wait to hear about all of your experiences in more detail, see you soon, love always.